Thanksgiving is right around the corner and if you are a family caregiver for a senior parent you might be worried about how you are going to handle all of your care responsibilities and obligations while also enjoying this season with your family. 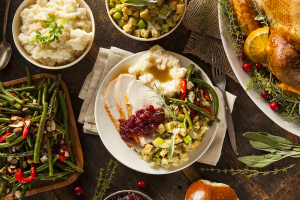 If your home is going to be hosting Thanksgiving dinner this year, or your parent has always been the one who has handled this holiday but their challenges and limitations have made it such that they are not able to this year and you are taking over, it is important that you find ways to help you handle your holiday preparations in the best way possible without sacrificing your care efforts for your parent. • Start ahead. The easiest and most effective way to simplify preparation is to do as much of it ahead of time as possible. This will ease stress on the big day and can even present opportunities for your parent to get involved. Try making breads and crusts a few weeks ahead and freezing them, then doing prep such as chopping vegetables and drying out bread for dressing a few days in advance. • Focus on the stars. Every family has those special dishes that are the favorites and the ones that everyone looks forward to the most. On the same token, every family has those dishes that seem to appear on the table but barely get touched. This year, trim out those less than desired items and focus on the ones that everyone loves the most. This will save you time and money. • Go for pre-made. You may think that it is not really Thanksgiving if you do not spend all day in the kitchen, but that does not have to be the case. Choose a few dishes that are really important to your family, such as the turkey and your grandmother’s macaroni and cheese recipe, and prepare those the traditional way. Then choose other items that your family enjoys but are not necessarily special and choose a pre-made option, such as packaged mashed potatoes. • Make serving easier. It is easy to go overboard when it comes to preparing and serving Thanksgiving dinner. You are likely to cook way too much and then when it comes time to serve the meal, everyone loads up on far more than they should eat. Help to eliminate both issues by preparing individual servings. Rather than making a whole casserole dish of dressing, prepare enough to fill one to two muffin cups per person and bake them that way. Then you are able to give each person an individual serving that is easier to clean up. • Try a potluck. You are already spending time with your family for this holiday, why not make the entire experience a family affair? Invite your loved ones to bring along their favorite holiday dish or assign different elements of the meal to different relatives, then focus on the main dishes yourself so that your family can enjoy a bountiful feast without you having to go through all of the trouble yourself. Starting senior care for your aging parent can be one of the best decisions that you make as you are approaching the holiday season. This is a time that is often extremely busy and stressful for you, especially if you are in the sandwich generation, and the extra care and assistance provided by a senior home care services provider can make a tremendous difference for you. This care provider can understand the individual challenges and limitations that your parent has and create a personalized approach to care designed specifically to address those challenges and limitations and give your senior the highest quality of life possible. When it comes to the holiday season, including Thanksgiving, this can be truly invaluable as this senior care provider helps your parent feel involved in the family events, manage any emotional health issues that might arise, and stay active and engaged while also keeping up with their specific needs to keep them healthy and happy. This entry was posted in Senior Care Germantown TN and tagged Senior Care Germantown TN. Bookmark the permalink.